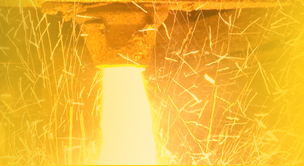 Introduction: Crucible furnaces are among the oldest and simplest furnaces used in the foundry industry. They are primarily used to melt smaller amounts of nonferrous metals but can also be used for ferrous metals. 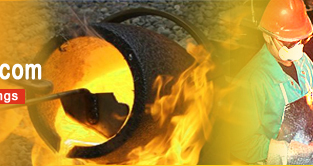 Crucible furnaces are mostly used by smaller foundries or for specialty alloy lines. The crucible or refractory container is heated in a furnace, typically fired with natural gas or liquid propane, although coke, oil or electricity have been used. There are three common crucible furnaces: bale-out furnaces, where molten metal is ladled from the crucible; tilting furnaces, where the metal is poured directly from the furnace; and lift-out furnaces, where the crucible can be removed from the furnace and used as a ladle. In the gas fired furnaces heat is provided by a burner directed to the crucible. In the resistance furnaces electric heating elements are used as a source of heat. Process: The crucible furnaces are heated with natural or producer gas by the regenerative system, though many coke-heated furnaces, similar to a brass-melting furnace, are still in use. Fig. 30 shows a vertical transverse section of a typical modern gas furnace for melting crucible steel. The greater part of the structure is in the regenerators, their walls and ports, while the furnace proper (the brick work surrounding the crucibles) occupies a comparatively small space. The regenerators have gas, air, and chimney connections as shown in Fig. 26 and need not be further described here. The top of the brick work is 8 covered with steel plates A, A, to form a suitable charging floor for the convenience of the furnace men. The structure contains usually four or more receptacles, B, which are the spaces for holding the crucibles and are commonly called the "melting holes." Each hole is large enough for six crucibles, and is covered with three movable lids, one of which is marked C. Linings of melting holes and of gas and air ports are so built of refractory brick that they may be easily renewed when worn out. The several sets of melting holes are separated by thick fire-brick partitions. The bottom brick work of the melting holes and these partitions are supported by ribbed cast-iron plates, D, placed edge to edge over the vault F, which extends the entire length of the structure. Each melting hole has a 7-inch opening through the bottom to allow the steel to flow into the vault in case a crucible breaks. The vault F is kept closed at the ends while the furnace is in use. Directly over the line of melting holes and enough above to allow ample head room, is a trolly bar equipped for lifting and lowering crucibles. The melting-hole covers are usually dragged aside and pushed in place again by an iron rod suitably made for this use. Crucibles are lifted from or lowered into the furnace by means of tongs supported from the trolley bar. Feel free to contact us to buy or for more information on crucible furnace, crucible melting furnace and gas fired furnace.